Legend has it, he was born out of swag. Others say, he was raised by a pair of dingos. 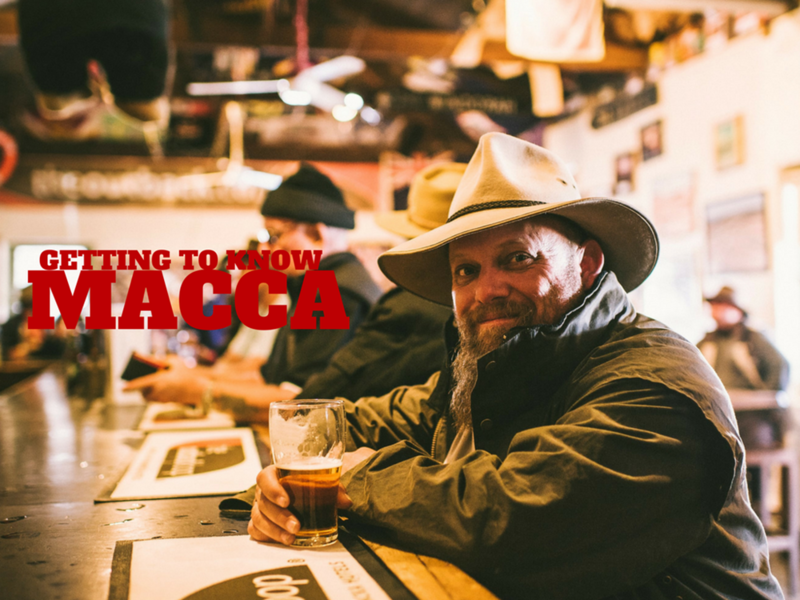 We're talking about none other than Craig McGown, otherwise known as 'Macca' from What's Up Down Under. He has been exploring and imparting his knowledge of the Great Outdoors for nearly half his life. He is quintessentially Aussie as they come (but he'd never openly admit that). We spoke to him recently about what it's like to be a host on one of Australia's most popular caravan and camping shows, where his favourite places to travel are and what keeps him going back for more. 1. Can you give us some background to WUDU and how you started with the show? What's Up Down Under airs on the 10 network on Saturdays at 4 pm and again on Sundays at 5 on One HD. It's a national travel program showcasing caravans and RVs travelling around Australia's most amazing places. I started on WUDU about 2 and a half years ago after working on other shows. 2. I think anyone that has met you, would say you’re a true blue Aussie through and through, would you say that is why so many people tune into WUDU to see you and the team? I'm not sure what the textbook definition of a "true blue Aussie" is but I'm happy to wear the badge if you're handing it out, thanks, hahaha. I would define myself as a passionate Aussie who loves travel and the bush. I've been fortunate to have spent a big part of my life in the Australian bush and have learnt from some of the best bushmen to have lived and worked this great land. The opportunity to share this experience with the viewers and followers excites me and perhaps that's why they join us to watch the show, but then again maybe some of them like to see my twin brother the cheeky larrikin come out to play from time to time, who knows? 3. You seem to have spent most of your life travelling all over Australia. What do you love about the great outdoors, what keeps you going back? I love absolutely everything about the Australian outdoors. I love waking in a swag in the middle of the Simpson Desert and looking at the stars. I love standing waist deep on the back beach of Fraser Island catching fish. I love picking the right line on a washed out track in the Victorian High Country or Cape York, Australia is a bottomless bucket when it comes to lists so I'll keep on reaching in. 4. What is the best aspect as a host on WUDU and what would you say is the hardest? Seriously, if I told you the hardest part of my job I wouldn't be able to find a breath of sympathy from anyone. I have the best job in the world! I pinch myself every morning to see if it's real. If it's a dream, don't wake me up, I'm loving it. 5. How do you unwind after a hard day of filming? Well, I've never been too big on yoga and meditation so I stick to what I know. I grab my mates, light a fire where we can and have a laugh. We've got a lot of pretty creative people in the team and that extends to music, there's always a guitar or two close by. If we're somewhere where we can't have a fire, we will normally seek refuge for some fellowship somewhere in town - the pub. Having said that, we do work quite long days at times and on those ones you kind of find yourself just looking for a pillow. 6. What has been your favourite destination so far? This is my most common and toughest question. It's tough because I don't have one - it depends on the time of year. If you asked me where my favourite place was in winter I'd tell you the Kimberley, in summer the Vic High Country or Tassy. If you're looking for me at Easter and I'm not working you'd find me on the East Coast somewhere and give me WA in spring anytime. 7. Where is the best pub you have visited? The one that hasn't run out of beer! Hahaha, I have a few favourites and they are mostly located hundreds if not thousands of km's from the nearest city. The beer tastes pretty much the same at all of them, it's the quality of the characters you interact with that changes. Give me a smile in a country pub any day mate! 8. Favourite camp cooked meal? My all time favourite meal is a roast. Back from when I was a kid and nan and mum would knock one out every Sunday. It's been my go-to comfort food. To sit down in the scrub after a big day to a camp oven roast takes me home and fills me with good memories, pass the gravy will ya? My drive tunes are by all accounts of most who travel with me a little tragic. I'm a bit of a country fan (but I suppose you already pigeon-holed me as one of those), with some Aussie rock thrown through it. Cold Chisel and Tania Kernaghan have kept me awake on many a late night drive and I've got to say, I reckon I sound pretty good singing along in the cab (in my opinion only). 10. What’s your number one tip you’d give to someone wanting to start the RV lifestyle? Do it! It's not about how much money you've got, buy the best gear you can afford and get out there, smell the freedom. 11. Top three gadgets anyone should install in their touring vehicle? A good auxiliary battery system, beer tastes rubbish hot! If you're towing a good brake control system, happiness is not the tail wagging the dog. A good system of recharging your auxiliary batteries when camped up such as solar because even when you're camped up, hot beer still tastes like rubbish! 12. We’ve been working together now with WUDU for a few years, what do you feel makes this partnership successful? Both WUDU and REDARC are good reputable Aussie brands who are proud of what they produce and are passionate that the Australians who rely on their products can do so in the knowledge that they were put first. I know that both organisations have their morals and intentions in the right place or to be flat out honest, I wouldn't be involved.